Typical iDAS installations today are considered analog. This is because the BTS converts the digital feed into analog RF form (see Figure 3.) The analog RF signals are attenuated and fed into a multi-carrier DAS Head-End for distribution. Most DAS Head-End equipment distribute the signals to a RRU (Remote Radio Unit) via fiber optic cable. That doesn’t mean the signal is turned back into digital form, but rather that DAS Head-End units have built-in optical transceivers that perform electric-to-optical (E/O) and optical-to-electric (O/E) conversion. This is called RF-over-Fiber. Optical transceivers use directly modulated lasers to perform this conversion. An analog RF transmission is one continuous wave which can’t be interrupted or resent (unlike digital data.) This is where you’ll hear industry terms like noise figure (NF), signal-to-noise ratio (SNR), and Spur Free Dynamic Range (SFDR). Analog DAS is not efficient and very costly. This is the inefficiency wagon again described in the iDAS vs. oDAS section. A high-power BTS pumps out RF signals that need to be attenuated and conditioned. The signals then travel through coaxial cables or jumpers which cause further loss affecting the overall link budget. The DAS Head-End converts the signal into optical form which also contributes to loss and adds unnecessary noise from the lasers in the optical transceivers. The signals are converted back into RF form and re-amplified at the remote node. More coaxial cables are needed between the remote nodes and indoor antennas. Passive components such as combiners, splitters and couplers contribute to more power losses. Heat dissipation from high-power RF equipment at the BTS is also a concern. Carriers must pay high utility costs cooling their equipment and maintaining a constant temperature. In addition, DAS equipment requires backup power. The panic would be bad enough if the power went off in a stadium full of spectators, but an even worse scenario would be dealing with the anxiety-ridden users robbed of their cellphone service or unable to update their Facebook status. Analog DAS does have its advantages however. It’s a truly neutral system because the components used are broadband. There are components that go as low as 20 MHz and as high as 3 GHz. Such bandwidth is enough for most cellular systems as spectrums tend to fall within 100 MHz to 2.8 GHz. 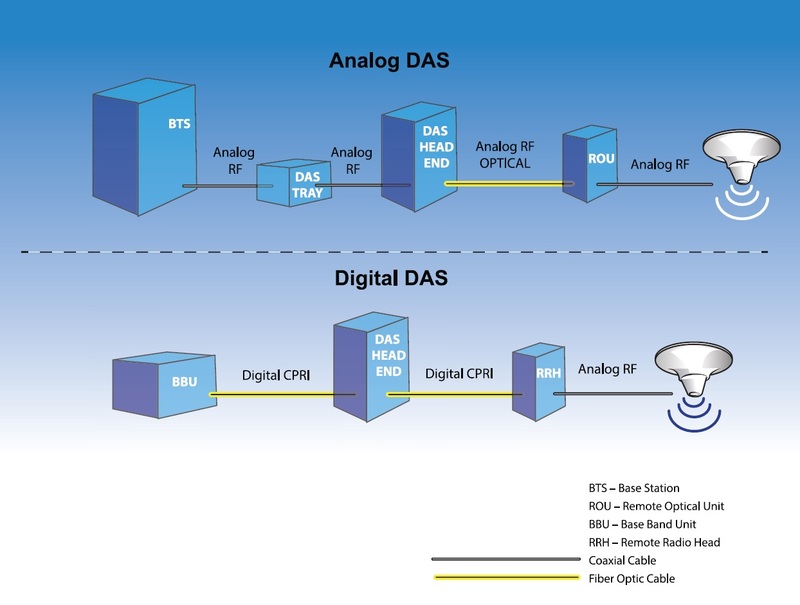 Analog DAS don’t distinguish between carrier spectrums or bands. As long as RF signals fall within the DAS specified bandwidth and don’t overlap, DAS performs its job of transporting them between BTS and indoor antennas. But Digital DAS is the future. The concept of Digital DAS is to perform digital-to-analog (D/A) and analog-to-digital (A/D) conversions at remote nodes rather than the BTS. It’s a much more efficient system. First of all, carriers won’t need high-powered BTS. Instead they’ll deploy equipment such as a Base Band Unit (BBU) that connects directly to a carriers’ fiber backhaul. Remember backhaul is the fiber optic network that connects a carrier’s central tower to its remote hubs. A BBU performs the same function as a traditional BTS but without its bulky RF processing modules. Because everything is digital. There’s no need to perform analog-to-digital conversions at a BBU location. A BBU essentially functions like a network switch or router that directs traffic. In this instance, the traffic happens to be cellular. BBUs will be connected to low-power remote radio nodes such as MROs (Metro Radio Outdoor) or MCOs (Metro Cell Outdoor). Such radio heads are manufactured by companies like Alcatel Lucent. This is where you’ll start hearing terms like Small Cells, used to describe digitally-fed low-power radio nodes deployed by carriers. It’s a convenient way for carriers to provide coverage without investing in expensive DAS equipment, filling the gap in areas where coverage is spotty or lacking. Carriers offer wireless subscribers living in remote areas with insufficient or no cellular coverage devices called femto-cells. These femto-cells are connected to a consumer’s home internet modem via ethernet cable and provide services for up to 5 simultaneous users. Such equipment has been available at carriers’ disposal for some time now. Think of Small Cells as femto-cells on steroids. Small Cells such as MROs or MCOs are capable of supporting 50 or more users at a given time. These nodes are connected via fiber optic cable to a BBU and have built-in MIMO capability for optimal signal performance and data throughput. Also, Small Cell nodes are smaller in size compared to traditional analog DAS RRH (Remote Radio Head) units. We earlier mentioned CPRI. It is another term you will sooner or later hear. CPRI stands for Common Public Radio Interface. It’s a standard developed by the likes of Nokia-Siemens, Alcatel Lucent, Ericsson and Huawai. Basically it’s a protocol allowing communication between digitized radio units like a BBU and remote nodes such as MROs and MCOs. The name CPRI is deceptive because it implies an open-source like platform, but there is nothing open about CPRI. This is in fact the very reason Digital DAS is not making further inroads into the US wireless market. Every manufacturer has their own proprietary version of CPRI protocol. Therefore, DAS vendors can’t build a system that interfaces with every BBU in the market thus defeating the very purpose of a neutral DAS concept. Carriers like Verizon buys BBUs from multiple vendors and each has their own version of CPRI protocol. There is no single DAS system out there that plugs into all vendor equipment at the same time. Chipsets manufactured by companies like Qualcomm are becoming less and less expensive. Chipsets allow digital-to-analog and analog-to-digital conversions one frequency or band at a time. Everything from smartphones and WiFi routers to Small Cell nodes like MROs and MCOs have one. However, chipset manufacturers haven’t yet made available a low-cost and commercially viable product that handles multiple frequencies. This creates a problem for Small Cell deployments. Every carrier will have their own version of Small Cell nodes because wireless carriers occupy and operate under different spectrum and frequency bands. Venues and city municipalities then have to deal with multiple small cell nodes hanging from light poles or placed inside buildings. Such scenes are not aesthetically pleasing and some DAS integrators have to deal with strict ordinances banning installations that include multiple nodes visible to the public. Density is another term being thrown around the DAS world right now. Basically, it means to maximize network capacity ultimately benefiting customer experience by employing various distribution methods including macrocells, oDAS, iDAS, Small Cells and WiFi. All these different distribution schemes concentrated in a single area create a hub known as a heterogeneous network or also known as HetNet. Fancy terms put aside, the reason behind this effort is simple. Wireless carriers want high data throughput and reliable coverage because their customers demand it. For whatever reason, we modern creatures can’t function without GPS, find restaurants without reading Yelp reviews, exercise without listening to music, stop to smell the flowers without checking our email and updating our Facebook status first. Oh, don’t forget uploading photos of our food to Instagram before we eat.